For 25 years, Writers Theatre has captivated Chicagoland audiences with inventive interpretations of classic work, a bold approach to contemporary theatre and a dedication to creating the most intimate theatrical experience possible. Writers Theatre has grown to become a major Chicagoland cultural destination with a national reputation for excellence, being called the top regional theatre in the nation by The Wall Street Journal. 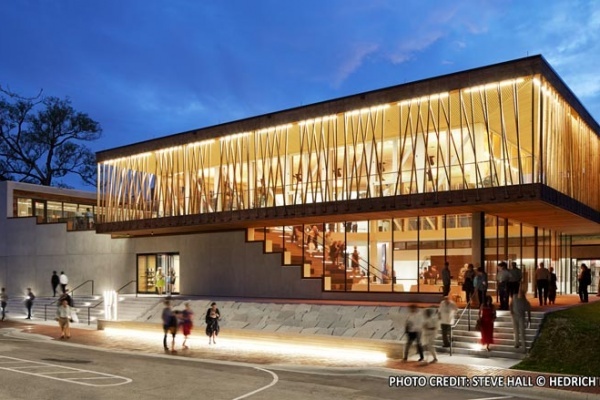 In February 2016, Writers Theatre opened a new, state-of-the-art facility. 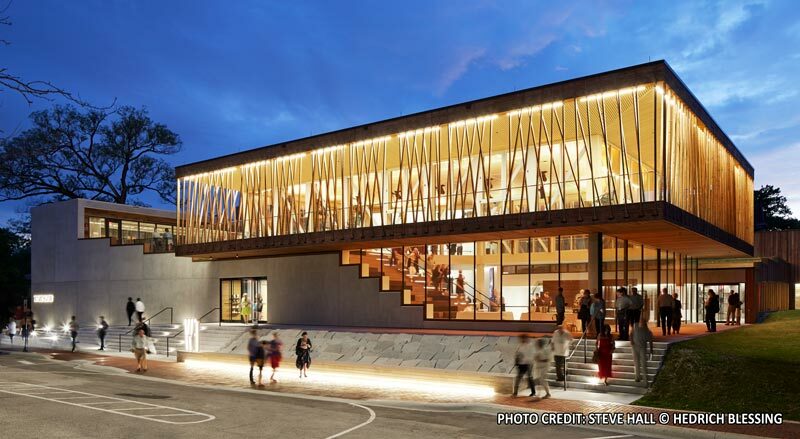 This established the company’s first permanent home—a new theatre center in downtown Glencoe, designed by the award-winning, internationally renowned Studio Gang Architects, led by Founder and Design Principal Jeanne Gang, FAIA. The new facility has allowed the Theatre to continue to grow to accommodate its audience, while maintaining its trademark intimacy. Parrett’s work consisted of oversized all wood direct sets and French doors constructed out of vertical grain douglas fir. We utilized our EPIC framing system and the narrowest possible wood door stiles to maximize the day-light-openings in this modern masterpiece. We also supplied and installed Rixson Floor Closers with 180 top pivot hinges and Rockwood flush bolts and push plates. The French doors measured 90” Wide x 122-3/8” Tall. All of the openings were glazed with dual insulated glass with a high performance Low E coating which helped the structure attain LEED Gold status. Another modern masterpiece that Parrett was honored to play a role in.